Beginning with a rather discreet, frightful scene from an infamous fictional work called The Mud Man, The Distant Hours quietly whisks the readers off to mysterious terrain,and deliberately stretches the reader’s imagination with all sorts of questions. For example, the reader will most likely ponder after reading the terrifying sequence of a horrifying mud man, seeking entrance into a large, rather doleful castle how this seemingly isolated scene fits logically with the rest of the story. Being a brilliant weaver of suspense and precise juxtaposition of scenes and plot revelations, Kate Morton writes with the rare meticulousness that the unofficial queen of English Gothic Suspense stories, Daphne Du Maurer, wrote with and greatly entertained readers for many decades in the twentieth century with this type of rare gift of conceiving Gothic Suspense stories that are subtly suspenseful. As I begin to shape my own stories, this is one of those techniques that is really hard to master: that art of subtlety. Many writers-especially some within the genre of epic fantasy- prefer to be boisterous and over-descriptive, getting too caught up sometimes in trying to somehow control the images and feelings that a reader gleans from a piece of writing. It is the type of writing that I myself have been becoming trapped in, and it is a very popular form of writing. It can be done skillfully, and it certainly still has that ability to win over large audiences of readers, and offer many intelligent points with a certain shred of authorial exactitude. Except, this writing isn’t the type of writing that I find lingers in your subconscious. When I first read Anne Rice’s Interview with the Vampire, her prose had that ability to filter through your conscious mind into your unconscious mind because that book had the sort of confident, artful prose that lets down that skeptical barrier of our minds. This is the part of the mind that discerns between fiction and reality; it is books that are written with the art of subtlety and a certain trust of letting the reader “believe wholly in the alternate reality of the text” that really do find themselves floating in our subconscious. The Distant Hours does just that, and it will effectively make you believe, as the reader, that the characters and settings within the story have a semblance of reality all on their own. You will believe that you are inhabiting their reality for a time, during the course of being riveted by the intelligently written moments of suspense that prevents readers from being bored with the text. 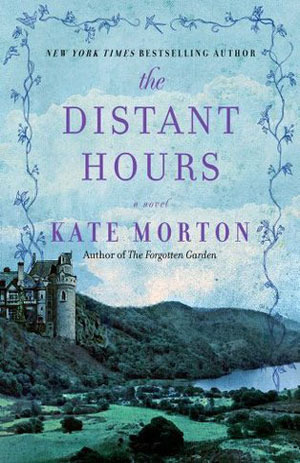 Much like Kate Morton’s Forgotten Garden, she takes familiar images and plot constructs from other English Gothic suspense novels,like Daphne Du Maurer’s Rebecca in the case of The Distant Hours, and creatively incorporates these elements in a fresh, inventive way. This book deals with questions about what constitutes reality, the meaning of our lives and existence itself, the notion of sin, the complex idea of love and forgiveness within a life that can be so mindbogglingly paradoxical at times. The versatility of The Distant Hours‘s writing also offers writers a certain implicit lesson on how to write adeptly, utilizing the tools of subtle prose. Much like William Shakespeare’s The Tempest, The Distant Hours could read as a psychoanalytic work into the mind of the writer, who has been endowed with the seemingly preternatural ability to bend reality in a way that resembles magic. If you have ever watched Alfred Hitchcock’s brilliant film adaptation of Daphne Du Maurer’s Rebecca, you will love this book! I cannot get enough of Kate Morton’s writing, who has much to teach aspiring writers on how to write in a way that shows that you trust the reader’s ability to intelligently figure out the story on their own.